Hey, they ended last season on a three-game losing streak too. How you felt about Game 82 at Utah as a microcosm of the season as a whole probably says a lot about your personality as a Spurs fan in general. Even with the loss, they still finished with 61 wins, which is a helluva lot more than I figured they would without Tim Duncan. They easily attained the second-best record in the league, despite having only one All-Star, which is a remarkable accomplishment. Kawhi Leonard singlehandedly gives them a chance to compete in any given game. The team as a whole has shown amazing resilience —what Gregg Popovich calls “stick-to-it-ive-ness” and has demonstrated, time and again, the ability to come back from considerable deficits. They came back from 16 down in the third quarter to take a late lead tonight. LaMarcus Aldridge finished his regular season on a high note, leading the club with 18 points on 9-of-14 shooting, while adding three steals and a block on the other end. Pau Gasol capped off a better season in San Antonio than most naysayers anticipated he’d have at 36, and eclipsed the 20,000 point plateau with 13 off the bench against the Jazz. Manu Ginobili had another one of his patented you-steal-one-off-me-and-I’ll-immediately-steal-it-back-off-you sequences that never fail to delight me. He still does that stuff, even at 39. Uh, did I mention that no one got hurt? Not that we didn’t tempt fate, by the way. Pop actually checked Ginobili back into the game with 4:21 remaining, briefly causing me to “go Serbian” at my television, but Ginobili immediately took a foul and I think he thought better of it, quickly pulling him in favor of Jonathon Simmons. Oh, and the Spurs may have a secret weapon for the playoffs, but we’ll get to that in a second. There were sloppy turnovers. Soooo many sloppy turnovers. On the second possession of the game Dewayne Dedmon was at the high post, trying to take Hill off the dribble, with predictable results. At one point later in the quarter I swear Danny Green tried a running hook shot. Even Leonard, perhaps informed that winning the MVP would mean that he’d be expected to give a public speech, played the least inspired first quarter I’ve seen from him in possibly ever, before eventually remembering that he is Kawhi Leonard and ramping up his engines. The Jazz built a 23-6 edge in points off turnovers, second chance points and points in the paint; and they even nailed 4-of-7 threes, with Rodney Hood banking in a 30-footer at the buzzer to take a 32-23 lead after one. Both teams settled down a bit after that in the second quarter, though the Spurs ball movement was still nowhere to be found. Boris Diaw was eating David Lee’s lunch (wonk wonk) again and Derrick Favors got a few buckets inside while Aldridge answered with 10 for the Spurs. It was the kind of quarter where if anyone can recall a single specific detail a week from now, you’re lying. The third period was mostly alarming. The defense was M.I.A., to the degree that Jazz color man Matt Harpring was making it sound like Utah’s starting five could give the Warriors a run for their money in the playoffs. Gordon Hayward was nailing tough step-backs, Gobert was cleaning up around the rim on drive-and-kicks and Joe Ingles canned a pair of threes. All the Spurs had going for them in response was Parker and Gasol. It turned out to be a 29-26 quarter for the Jazz, but it was only that close because they called off the dogs early. Gasol is as skilled a big-man as we’ve ever seen and not only is he a sure-fire first-ballot Hall-of-Famer but I will go to my grave believing it was criminal that voters gave Kobe Bryant the 2010 Finals MVP over him. It was even more of an injustice than Ginobili getting robbed in 2005, and I’m not about to get over that one anytime soon, either. Anyway, even though Gasol’s scored more points against the Spurs in his career than for them than for them —852 to 792, not counting the playoffs— he’s someone whose game I’ve always enjoyed from afar and someone I’ve wished was a Spur forever. I’m happy I got to enjoy him on the team, better late than never. 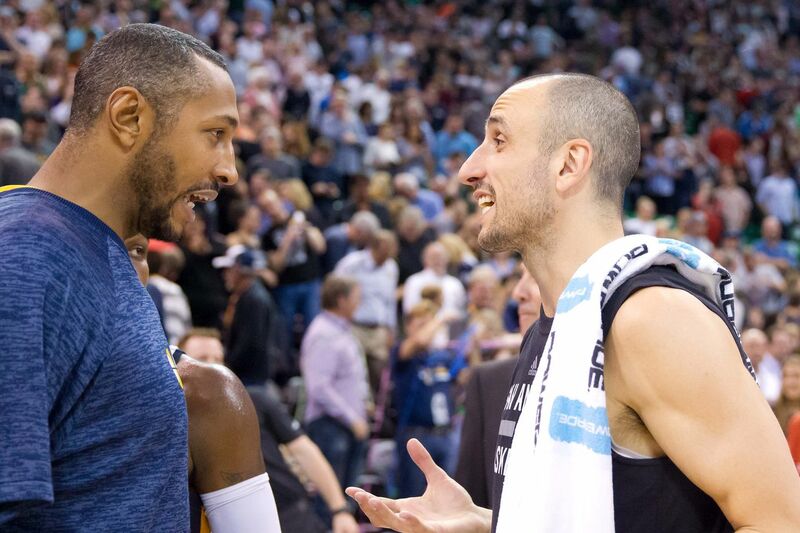 This might’ve been the final regular season game of Ginobili’s career too, but I’m trying not to think about that. I’ve been wrong the last two years and he hinted to Jabari Young of the Express-News that it’s not the foregone conclusion most believe it to be. Okay, time to wrap this up with the only actual interesting thing about the game, besides, again, that there were no injuries to report. The real season gets underway on Saturday. Quit losing games, Spurs.